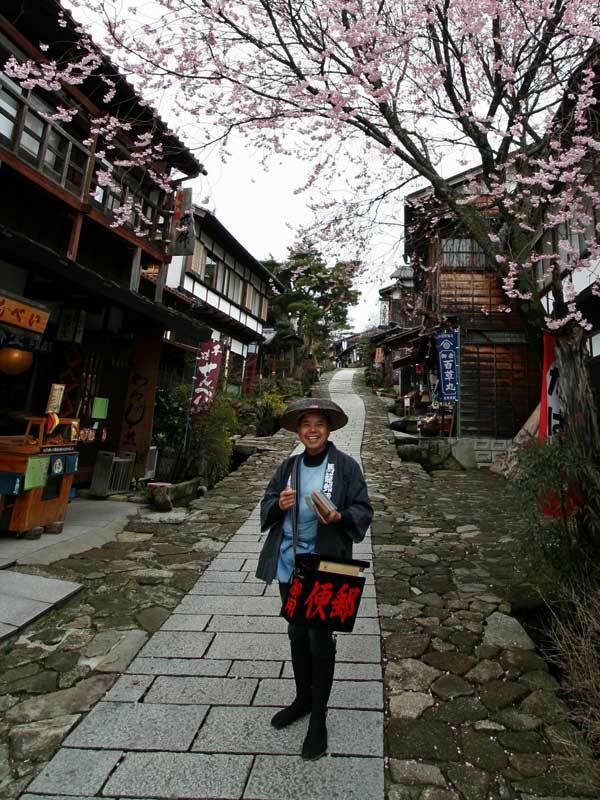 A moderate walking tour along an ancient thoroughfare through central Japan. Walk Japan's pioneering walking tour of Japan. An excellent, guided introduction to Japan while strolling along an historical road from Kyoto to Tokyo; great walking through rural and mountainous countryside; traditional and modern inns, hearty farmhouse cuisine. 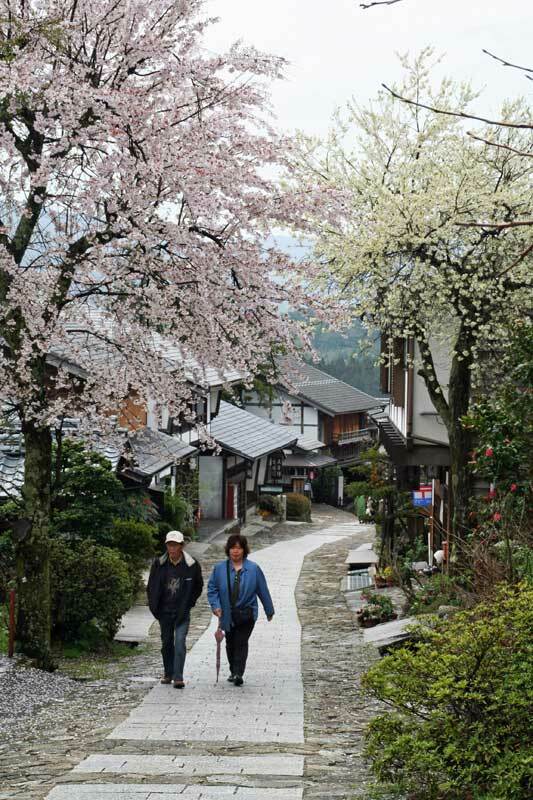 The Nakasendo Way tour is a fully guided tour suitable for anyone who can walk for more than three to four hours in comfort. In general, the route is gently undulating but also includes some short, steeper climbs. Please read more on Tour Levels here. An 11 day, 10 night tour starting in Kyoto and finishing in Tokyo. Tour accommodation is in hotels and Japanese inns. The maximum group size for this tour is 12 persons. We have no minimum size. If we accept a booking we guarantee to run the tour. The Nakasendo Way is a fully guided, walking tour between the Nakasendo's beginning in Kyoto to its end in Edo, modern-day Tokyo. Walk Japan's pioneering walking tour of Japan, the Nakasendo Way provides a unique, intimate experience of Japan and its people. 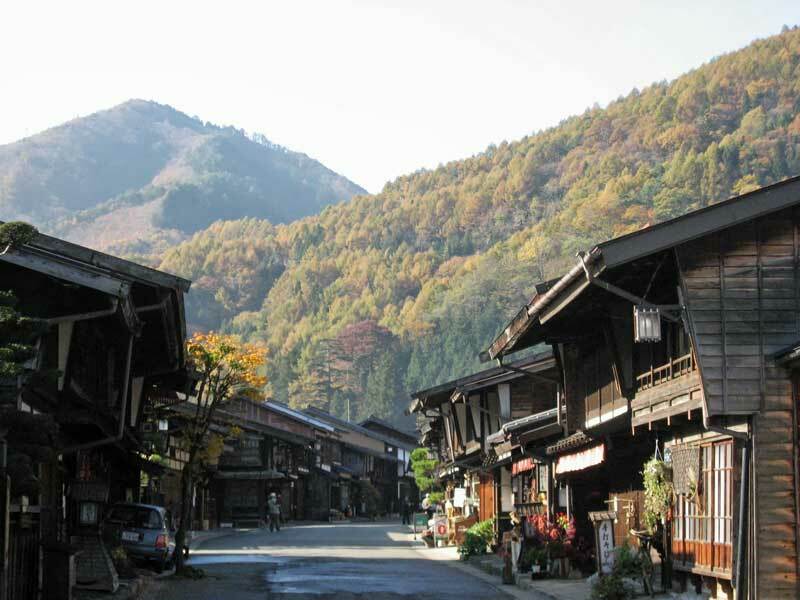 The Nakasendo Way tour explores one of Japan's ancient highways, the Nakasendo, which literally means 'the road through the mountains'. It starts in Kyoto, one of Japan’s ancient capitals and to this day the cultural epicentre of the nation; follows some of the best parts of the old road through rural countryside deep into the mountains of Japan’s Central Alps. Finally, we arrive in Tokyo, the glistening, modern capital. In its heyday in the 17th Century, the Nakasendo was crowded with travellers, including feudal lords, samurai, itinerant merchants and pilgrims. 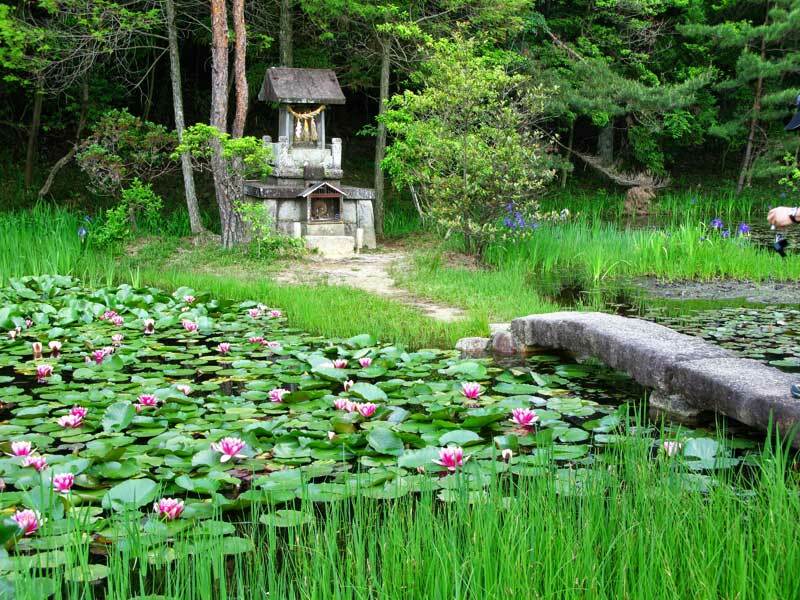 Now largely forgotten and quiet, the road provides a pleasant path through scenic countryside and, also, the history of Japan. We pass through and stay in picturesque, old post towns on route in much the same way that the Japanese traveller of old did. Charming, traditional inns, which have somehow survived into the modern world, provide us with friendly and atmospheric overnight accommodation. 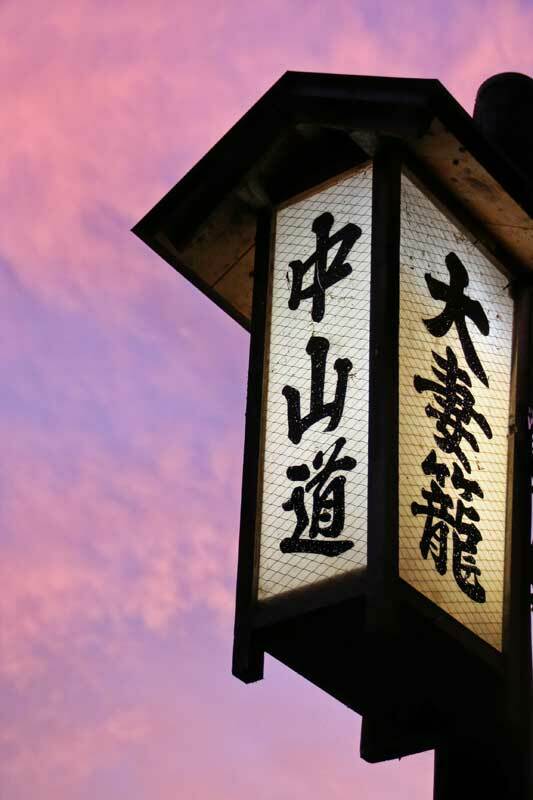 In the evenings, in an ambience reminiscent of Hiroshige's woodblock prints of feudal Japan, we relax and enjoy excellent meals. 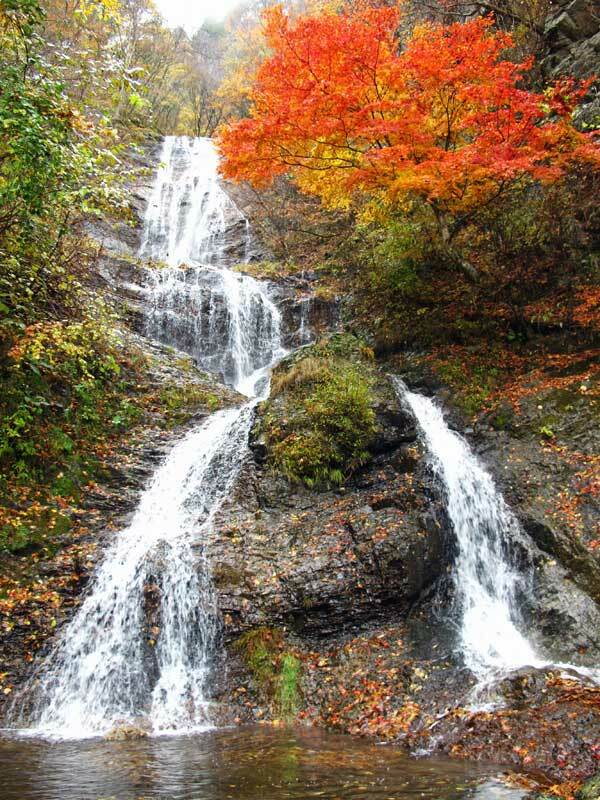 The Nakasendo Way tour follows the most beautiful and enjoyable parts of the old highway. 17th Century travellers insisted on a reasonably easy route for their journey and so do we. This is a walking tour, not a trek. The average daily walking distance is a moderate 10-24km (6.2-16 miles). Transport, however, can be arranged for those who desire a more relaxed day. Our main baggage is sent on each day so that we need only take what we need for each day in a small backpack. We climb several passes, but they have mostly gentle inclines and can be taken at a comfortable pace. We meet in Kyoto and travel together through Hikone, Sekigahara, Magome, Tsumago, Narai and Karuizawa before finishing our journey at Nihonbashi in Tokyo. Walk Japan provides tour participants with easily followed, detailed instructions on how to join the tour. More information about the history of the Nakasendo highway is available at our complementary website Nakasendo Way: A Journey to the Heart of Japan. 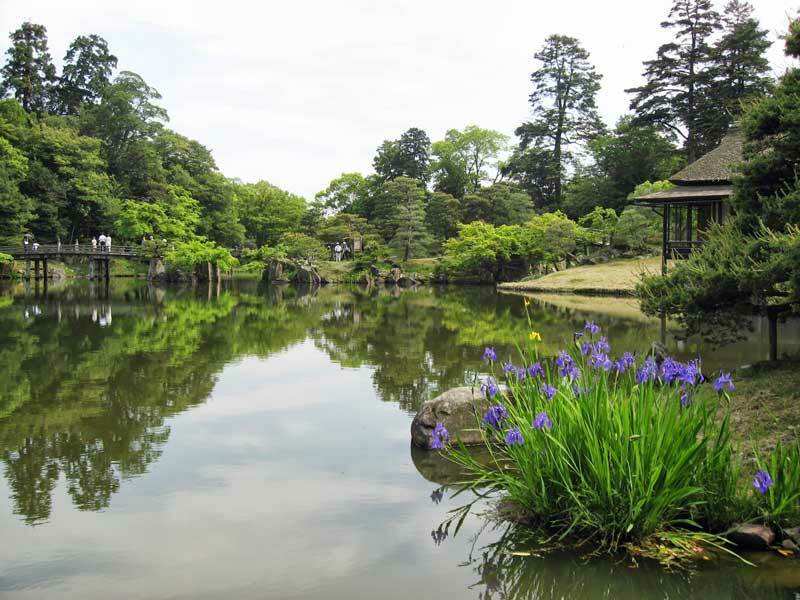 The itinerary for the Nakasendo Way tour is ground only beginning in Kyoto and ending in Tokyo. Prior to the tour, Walk Japan will provide detailed instructions for travelling to the meeting point in Kyoto from Osaka's Kansai Airport (KIX) and Tokyo's Narita (NRT) and Haneda (HND) Airports. At the end of the tour, travellers are advised not to book themselves out on an early morning flight as it can take up to 90 minutes to travel from our Tokyo accommodation to Narita Airport and more than three hours 30 minutes to Kansai Airport. Haneda Airport, though, is a 30 minute journey by taxi and easily reached at any time of the day. Please note that on Day 2 and Day 9 the main baggage will be shipped in advance overnight. On these days all items you require for overnight will need to be carried by you and your daypack should be sufficiently big enough to accommodate these items. For those who wish to spend more time in Kyoto you may be interested in our Kyoto Tour. 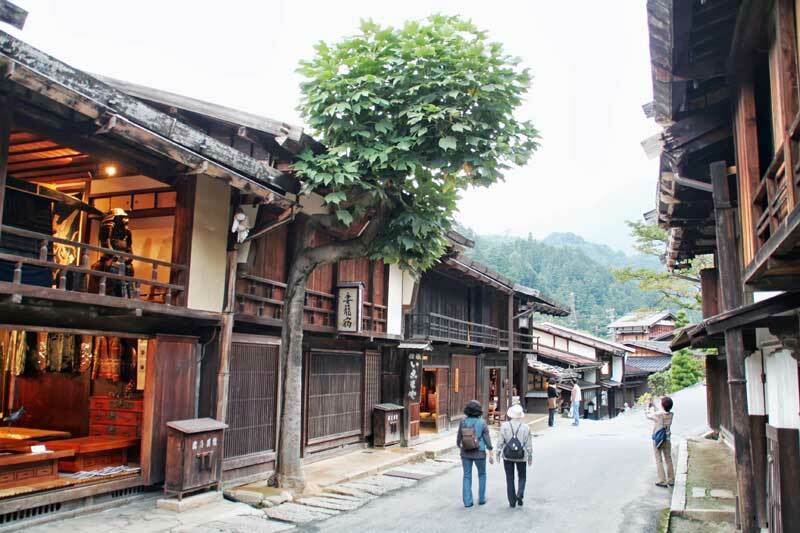 This tour runs over the two days from the day before to 5 PM on Day 1 of the Nakasendo Way tour (the Nakasendo Way tour group meets on Day 1 at 6 PM). In addition to the Kyoto Tour is our Tokyo Tour, which runs over the two days after the finish on Day 11 of the Nakasendo Way tour. The group meets for the tour briefing in the hotel lobby at 6 pm. Dinner follows with the Tour Leader at a hospitable local restaurant in the Pontocho district, a popular area of restaurants, bars and pubs. Here, on occasion, one or two of the famous geisha of the Gion district may be seen on their way to an appointment. En route we will visit the Sanjo-ohashi, the bridge marking the beginning of the Nakasendo highway. We set off by train for the feudal-period castle town of Hikone, on the shores of Lake Biwa, to visit the castle itself. 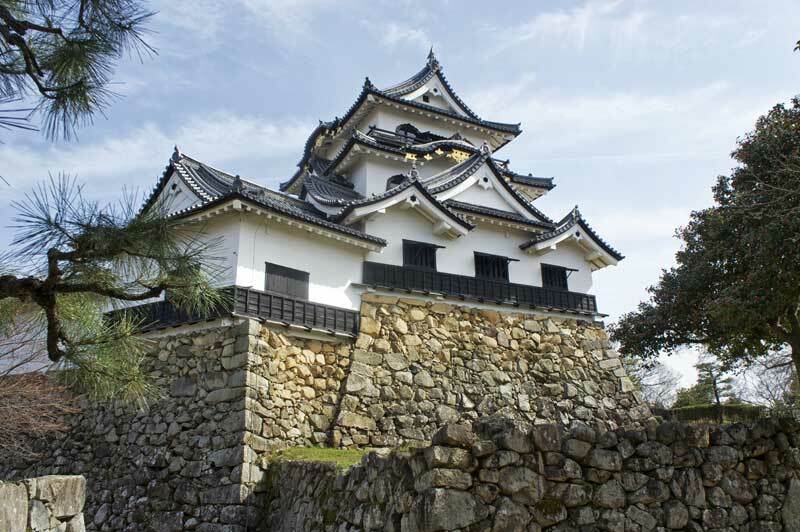 A national treasure, it is one of only a few in Japan that retains its main structure: the keep. We continue on by train to Sekigahara, which in 1600 was the site of one of the most important battle in Japanese history. This heralded the start of the 270-year-long Tokugawa dynasty and Edo Period. Our inn tonight has a history stretching over 1,000 years. Total walking: 8km (5 miles). Total elevation gain: 89m (290ft). A series of trains to Mitake are followed by our first long walk along the Nakasendo, through rolling countryside, to Hosokute post-town. Reminders that we are one of the five great highways of feudal Japan, are all around. 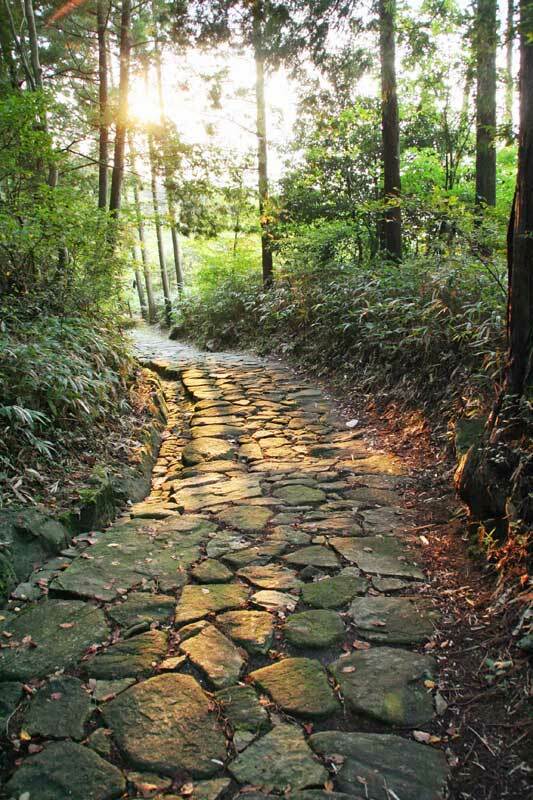 Occasional stretches of the path still retain the original ishidatami stone paving laid to assist on tricky uphill climbs. Wayside shrines abound for the protection of the foot-weary, and for the safe passage of the souls of pack horses who, from time to time, did not make it further. We also pass the sites of former tea-houses where travellers could stop awhile for a rest, a drink, and a quick bowl of noodles. We stay overnight in a 17th Century inn. Total walking: 12km (7.4 miles). Total elevation gain: 465m (1,525ft). We walk to Ena along a ridge-top route dating from the 8th Century. After a stretch of quiet, country road, we begin a gentle ascent through forest on a section of the Nakasendo that lay forgotten for decades. 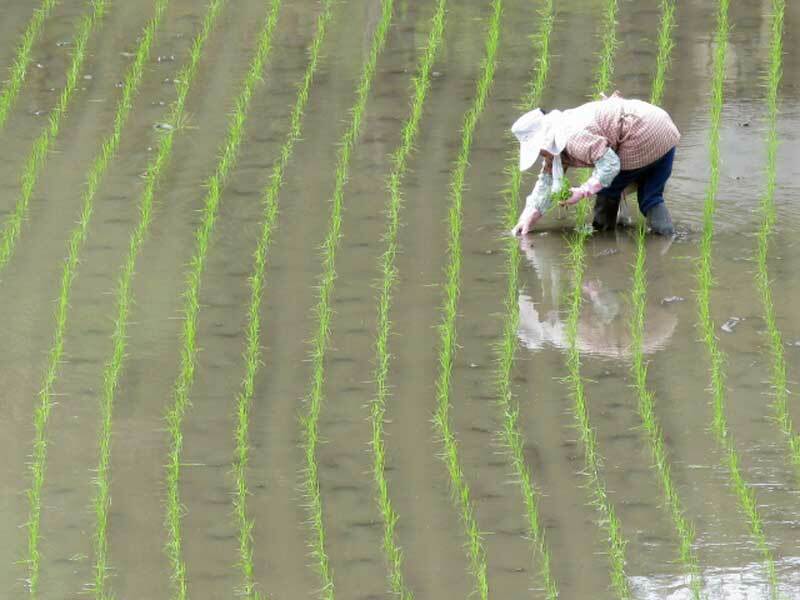 It is said to incorporate the longest continuous stretch of original ishidatami in Japan. After negotiating a low pass, we descend to the Okute, at one time a post-town and now a delightful hamlet. At the entrance to the town we encounter a giant cedar tree that is said to be 1,200 years old and venerated as a kami, or Shinto god. Okute is charming and still retains its 19th-century character. For much of our afternoon walk, the old highway follows a trail through forest. 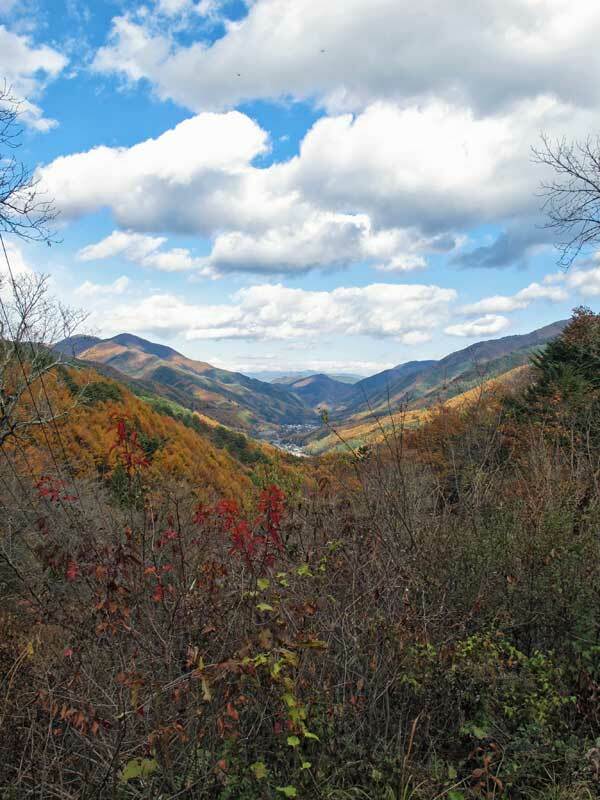 This section, known as the Jusan-toge, which translates as the Thirteen Passes, is actually a gently undulating route along ridge tops that offer many fine views of the distant mountains. This section of the highway dates back to the 7th Century when the valleys on either side remained uncultivated and virtually impassable. We emerge from the forests to the roar of traffic on the modern expressway, which marks our arrival in Ena. Here we visit a charming local museum, before retiring to our accommodation. Total walking: 22 km (13.6 miles). Total elevation gain: 346m (1,135ft). Our morning’s walk takes us across undulating countryside to Nakatsugawa, an old post town and now a pleasant regional hub. In the afternoon, we begin in similar fashion to that of the morning, except the general direction of our route is distinctly uphill. We now embark on the climb that tomorrow takes us over Magome Pass, which leads to the Kiso Valley and the heart of the Nakasendo. Superb views of the way ahead, and the way we have come, make this a memorable walk. 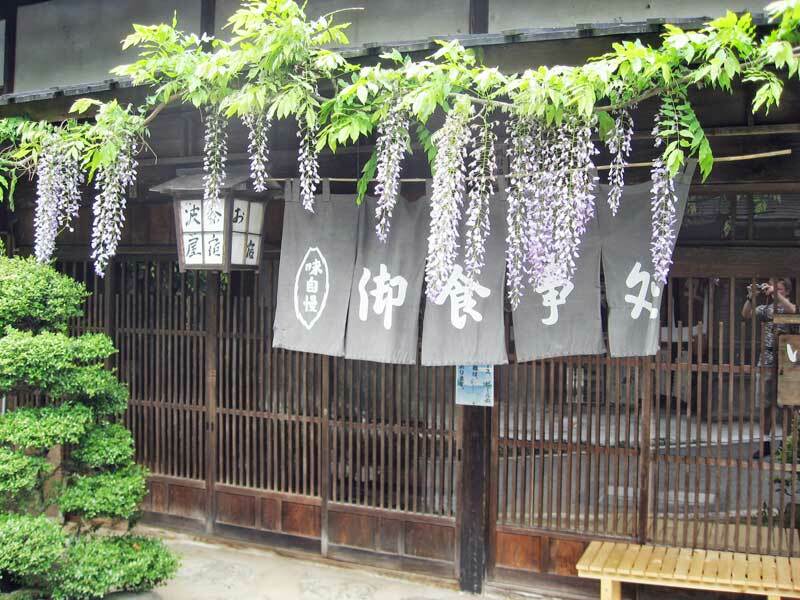 Our inn tonight is called Shinchaya or New Tea House, which is steeped in history. The last stretch is a stiff climb, but it is all made worthwhile by the delightful location of our inn, which is the gateway to the Kiso Valley. Total walking: 18 km (11 miles). Total elevation gain: 425m (1,394ft). A short walk brings us to Magome post-town, birth-place of 19th century author Shimazaki Toson. His novel, Before the Dawn, describes life during the tumultuous period following Japan’s opening to the West. Leaving the town, we follow the way up to the appropriately named Magome Pass and meander slowly downhill to a clearing in the cedar forest and a traditional teahouse. We stop here for some respite before continuing on via some waterfalls to our next inn in the small hamlet of O-tsumago. 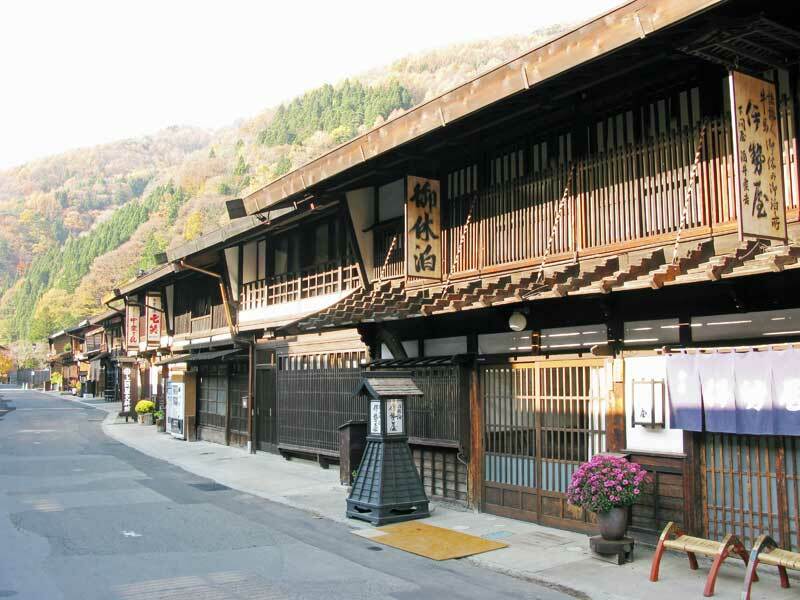 We drop off any unnecessary luggage here before venturing to the village of Tsumago close by. 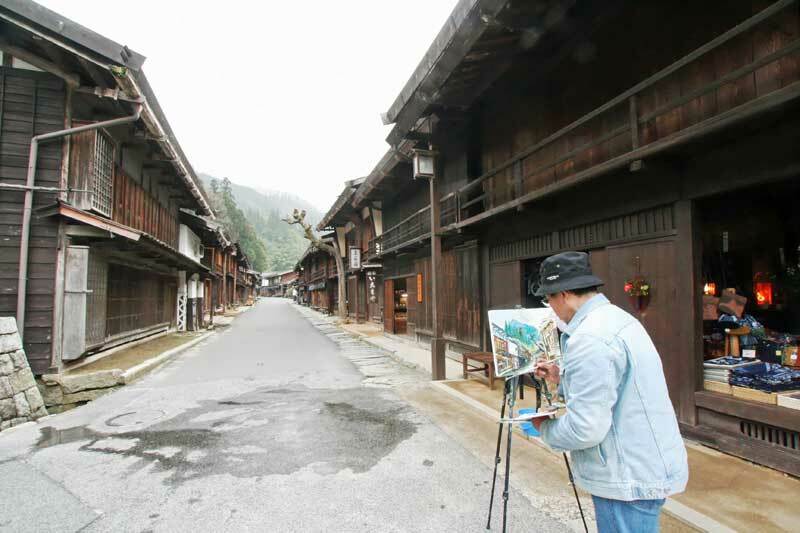 Tsumago is the best preserved and arguably the most attractive of post-towns found anywhere in Japan. The inhabitants take great pride in their town, and have banished telephone poles, electric lines and vending machines from the main street. 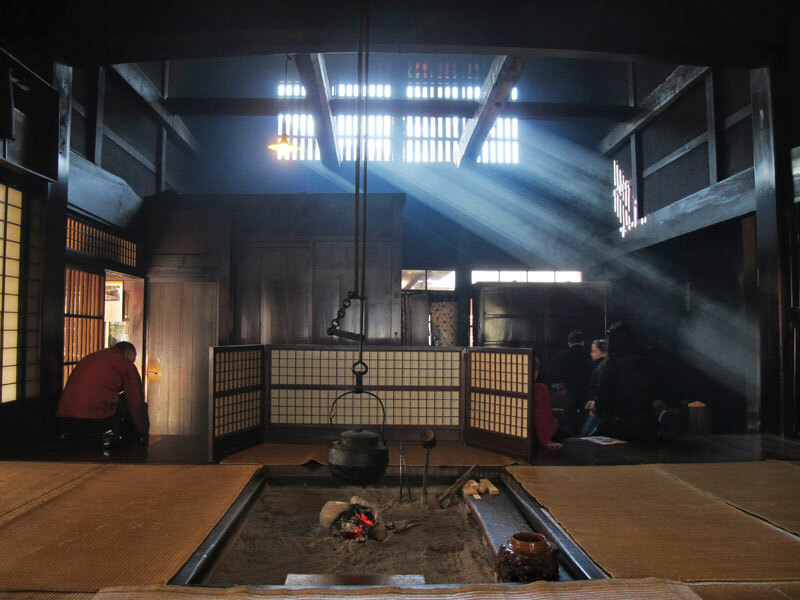 Following a guided tour of a former waki-honjin high class inn, once reserved only for the senior samurai, and now a museum, we return to our inn for dinner, and an evening bath at onsen thermal hot springs. Total walking: 10 km (6.2 miles). Total elevation gain: 461m (1,512ft). We follow the old highway on to Nagiso through picturesque hamlets and fields, passing by the site of Tsumago Castle. As we enter Nagiso town, we catch a glimpse of Momosuke-bashi, an impressive wooden suspension bridge, lying across the Kiso River. We now start one of the alternative routes of the old highway through this area, avoiding the easy riverside way which is now overlaid by a busy modern highway. Instead, we take the original route of the Nakasendo here. Over 3-4 hours, it takes us gradually higher and higher through quiet farming hamlets until a final ascent through forest to Ne-no-ue Pass. At many points along our climb, we see the remains of the extensive narrow-gauge logging railway system that once reached far into the mountains of the Kiso Valley in the early 20th Century. 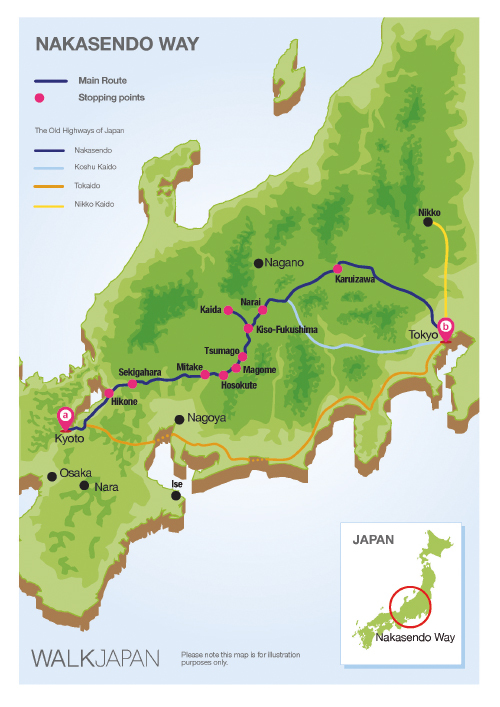 From the pass, it is an hour-long descent to Nojiri, from where a 40-minute rail journey takes us to Kiso-Fukushima. Our centrally-located inn has a welcome attraction: its own onsen to relax in before dinner. Total walking: 24 km (14.9 miles). Total elevation gain: 714m (2,340ft). Departing our inn, we first visit the reconstructed barrier station that straddles the old highway. 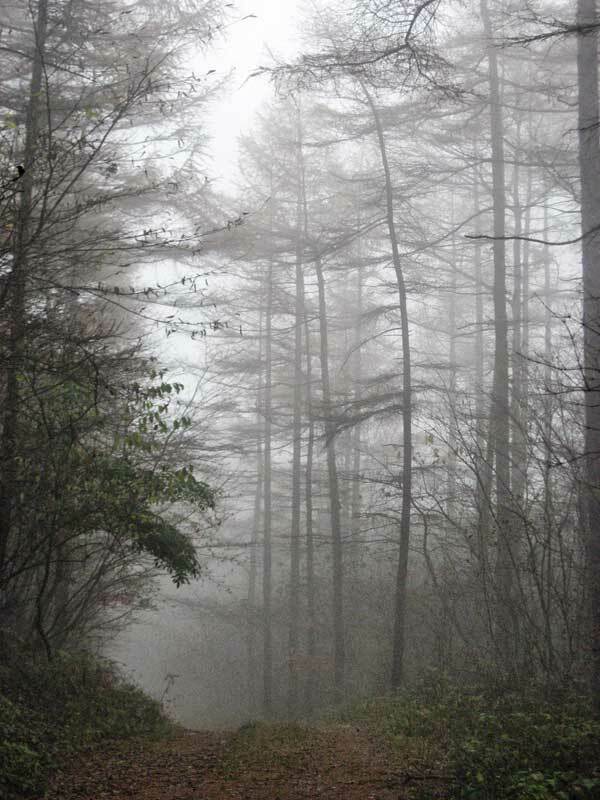 We then transfer part-way to the Kaida Plateau, where our morning’s walk follows an ancient path, up over the Jizo Pass. The plateau is dominated by Mt. Ontake, an active volcano that is considered sacred by Esoteric Buddhists. After lunch, our afternoon’s excursion takes us over another high pass that, on a clear day, provides views over the plateau to Mt. Ontake. We descend from here to our accommodation: another delightful, modern Japanese inn with onsen baths. Total walking: 14 km (8.7 miles). Total elevation gain: 673m (2,200ft). We transfer by bus to Yabuhara, from where we walk 8km over the Torii-toge pass to the lovely post town of Narai. 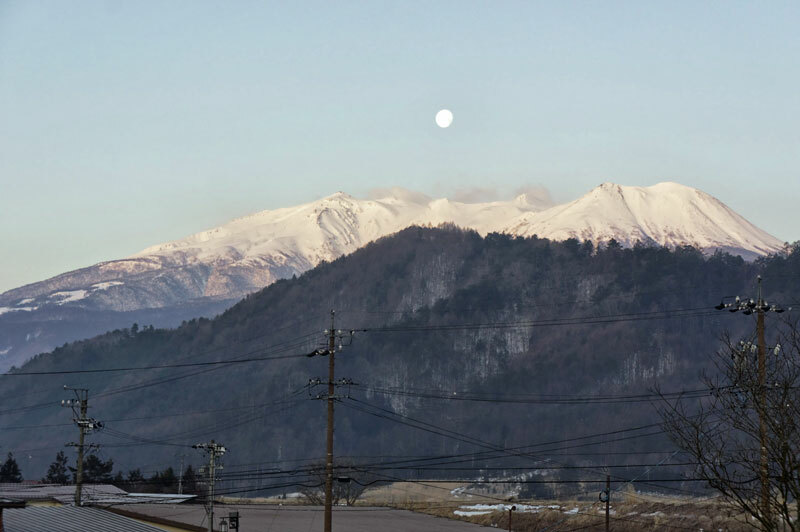 Here we have free time to explore, relax in cafes, and shop, before travelling by train through the grand mountains of Japan’s Central Alps to Karuizawa. 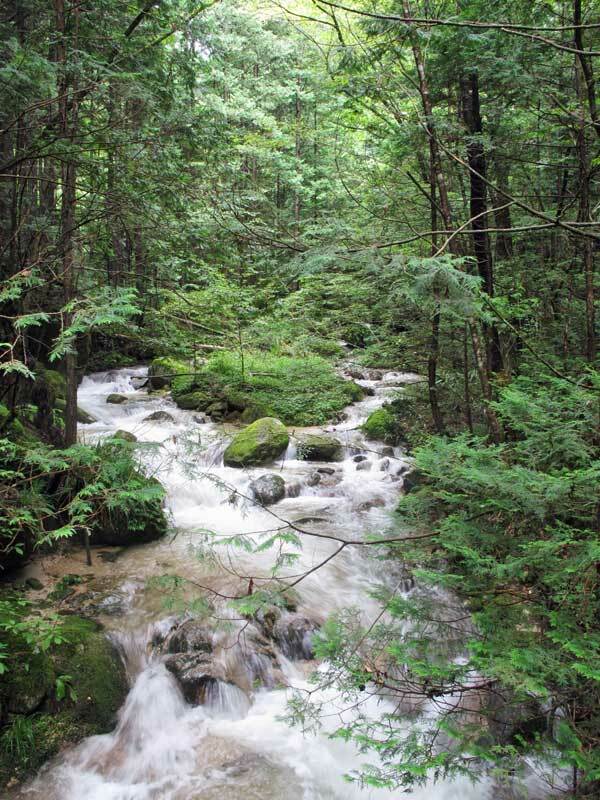 Once an old post-town on the Nakasendo Way, Karuizawa is now the epitome of a high-class mountain resort town in Japan. 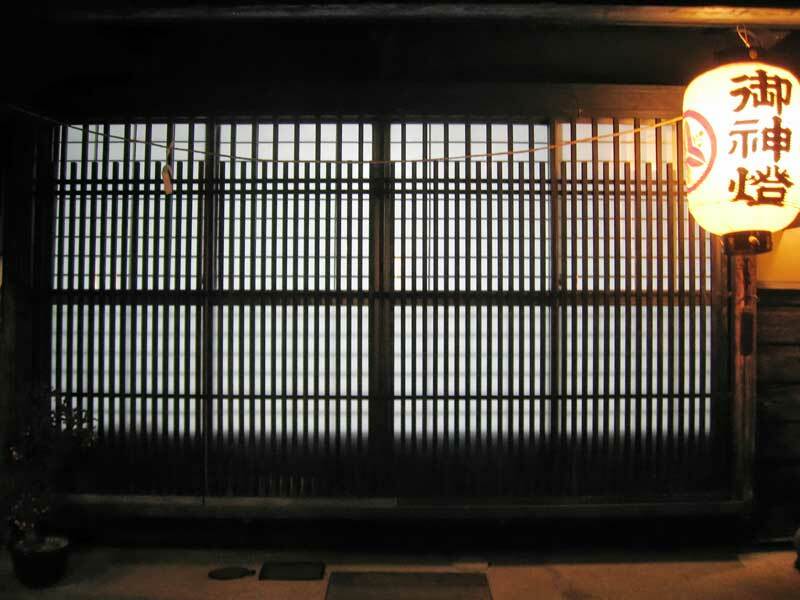 We stay in a top-class, historic inn that has deep associations with some of the nation’s top literary figures, including Tanizaki Junichiro and Akutagawa Ryunosuke. Total walking: 11 km (6.8 miles). Total elevation gain: 373m (1,220ft). 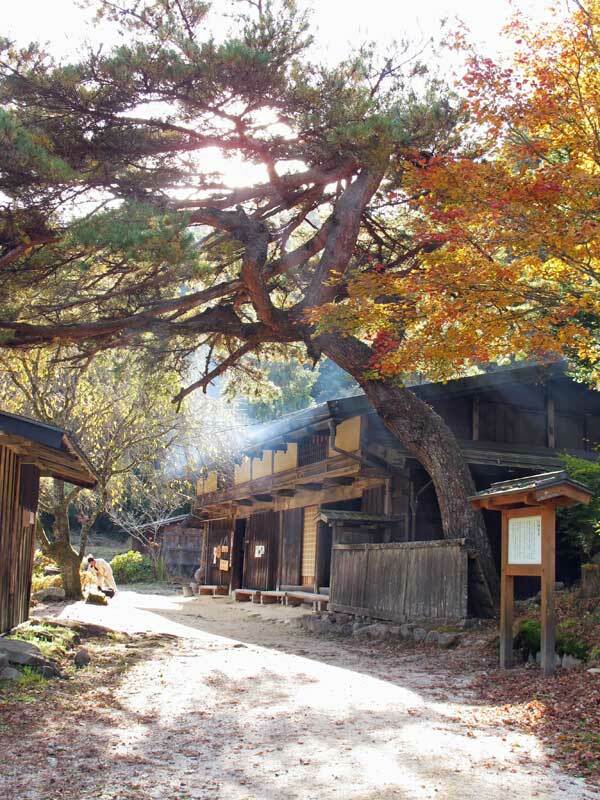 We step out of our inn onto the Nakasendo and are soon walking up through maple forests to the Usui-toge Pass. The pass gives spectacular views across to Mt. Asama, an active volcano. 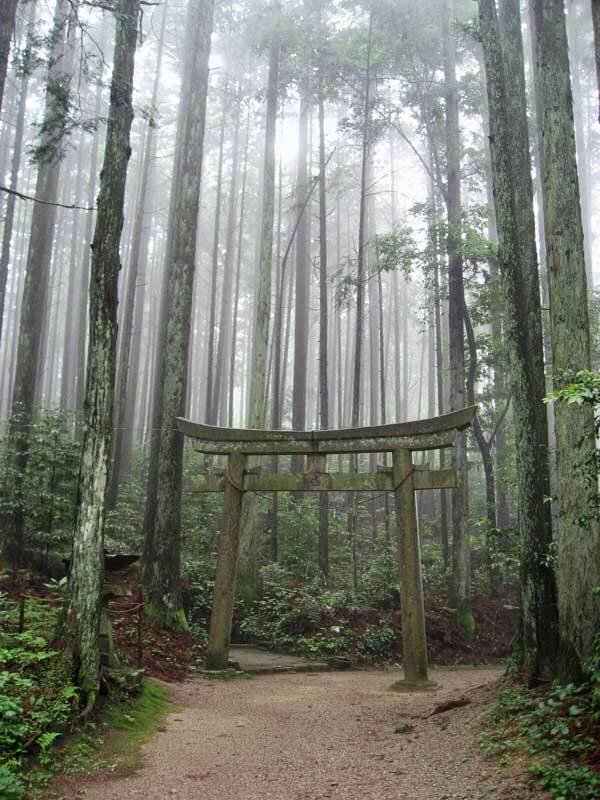 At 1,180 metres the Usui-toge is the second highest point on the Nakasendo that we visit. The long descent is on a footpath through mixed forest. Near the bottom there is a dramatic view of the valley and the next post-town of Sakamoto. 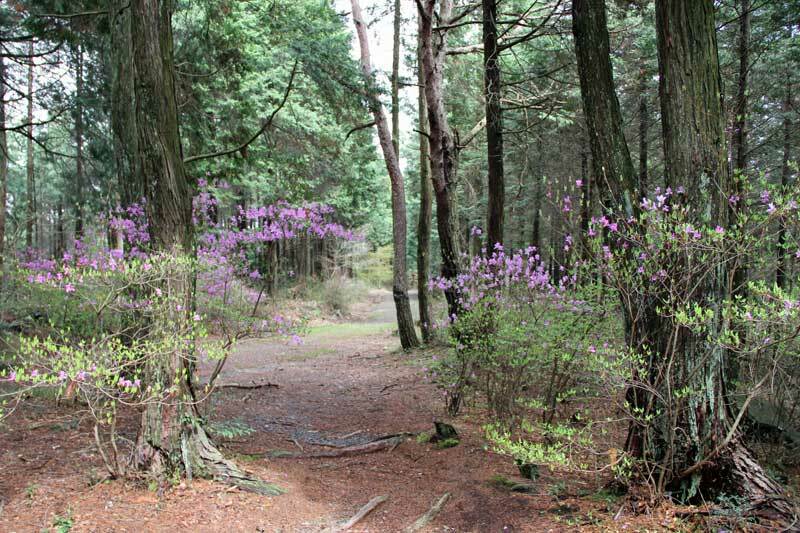 The final section of the walk is along a disused track-bed of the cog, or rack-and-pinion, railway that connected the plains with the highlands of Karuizawa and beyond. It was replaced in 1997 by shinkansen bullet trains, which speed out of sight through tunnels under nearby mountains. From here we travel by local and shinkansen trains to Tokyo, where we arrive late afternoon. We walk to Nihonbashi bridge, where the Nakasendo Way terminated, for a fitting finalé to our journey along the old highway before travelling on to our hotel and enjoying our last meal together. Total walking: 16 km (10 miles). Total elevation gain: 438m (1,440ft). The tour ends after breakfast. Your Walk Japan Tour Leader will advise on how to purchase train tickets for onward journeys within Japan or to your departure airport. Please do not hesitate to make your travel requirements known during the tour. 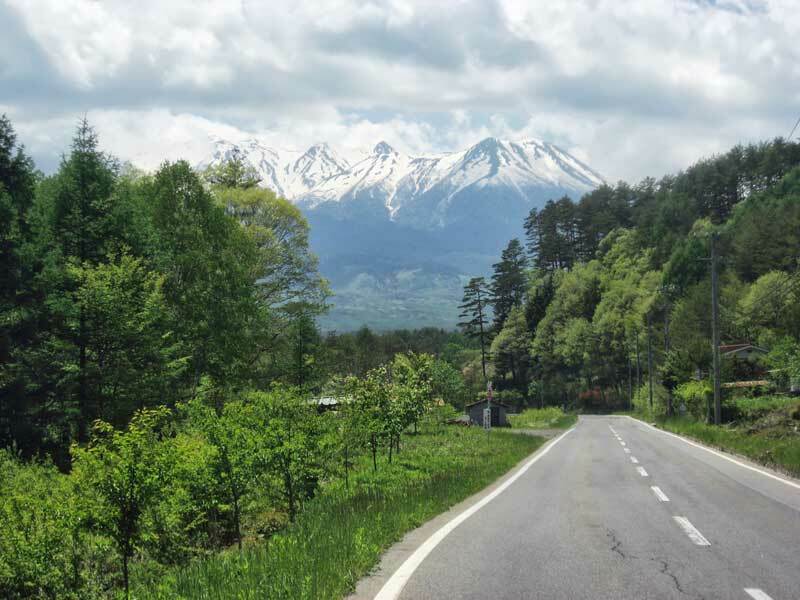 For more information about the history of the Nakasendo highway is available at our complementary website Nakasendo Way: A Journey to the Heart of Japan. 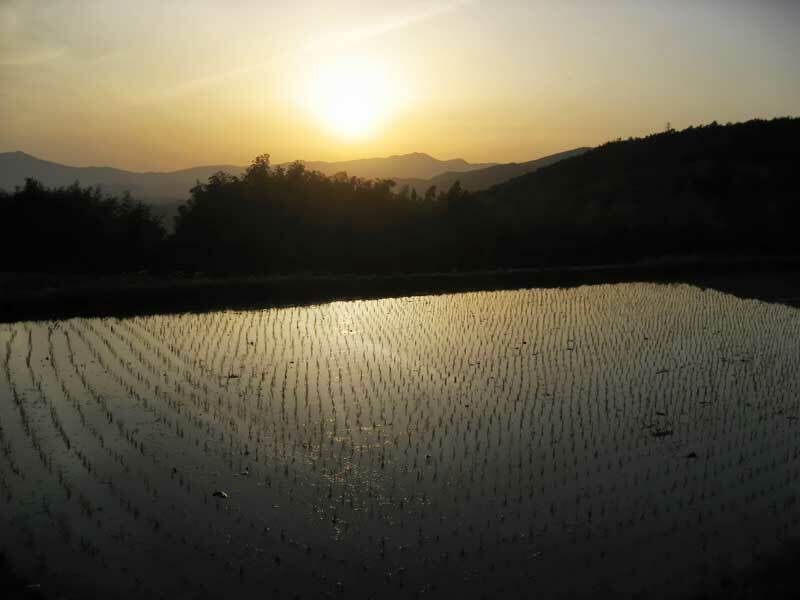 The itinerary for the Nakasendo Way tour is ground only beginning in Kyoto and ending in Tokyo. The airport closest to the tour's start at Kyoto is Osaka’s Kansai International Airport. Transfer is also easily made from both Tokyo’s Narita and Haneda International Airports. From Osaka’s Kansai International Airport Haruka Express trains depart to Kyoto Station, where the train terminates. The journey costs about JPY3,290 per person and takes approximately 1 hour 15 minutes. From here, take a taxi to the accommodation. From Tokyo’s Haneda International Airport Keikyu Line trains depart to Shinagawa Station, where Shinkansen bullet trains then depart for Kyoto. The journey costs about JPY13,900 per person and takes approximately 3 hours 10 minutes. From here, take a taxi to the accommodation. From Tokyo’s Narita International Airport Narita Express trains depart to Tokyo Station, where Shinkansen bullet trains then depart for Kyoto. The journey costs about JPY16,240 per person and takes approximately 3 hours 30 minutes. From here, take a taxi to the accommodation. Tour participants are advised not to book themselves out on an early morning flight at the end of the tour from Narita International Airport or Kansai International Airport. Haneda Airport, however, is a 30 minute journey away by taxi and easily reached at any time of the day. Single supplement: Available on a limited basis at JPY49,000. Please contact us for more details. 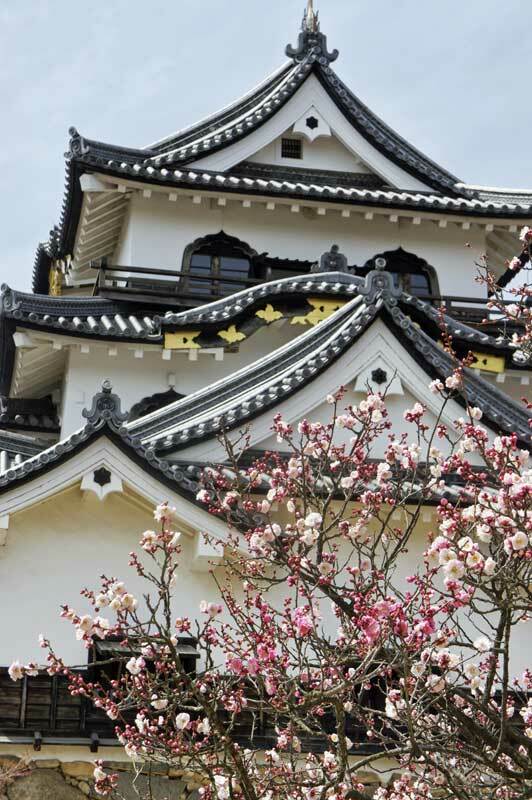 Included: Walk Japan tour leader; 10 nights' accommodation; 10 breakfasts, 5 lunches and 10 evening meals; luggage transfers; entrance fees; travel from tour start point to tour finish point.